Jay Akridge is provost and executive vice president for academic affairs and diversity, with a faculty appointment as professor of agricultural economics. He previously served for 9+ years as the Glenn W. Sample Dean of Agriculture where he had administrative responsibility for the academic, research, Extension, and international programs of the College. 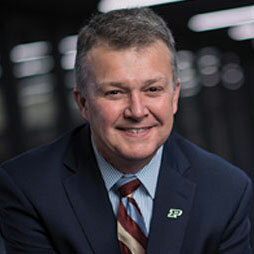 Jay served as director of the Purdue Center for Food and Agricultural Business from 2000-2007, as interim vice provost for engagement at Purdue in 2007-08 and as interim dean of agriculture in 2008-09. Jay has served in variety of leadership roles with the Association of Public and Land-Grant Universities (including Chair of the Policy Board of Directors for the Board on Agriculture Assembly), the Agricultural and Applied Economics Association, and regional research committees. He currently serves as Chair of the Executive Steering Committee of AgriNovus Indiana and on the Board of Directors of Agriculture Future of America. Jay is a member of the Farm Foundation Round Table where he has held a variety of leadership roles. He is the recipient of the Charles Murphy Award for Distinguished Undergraduate Teaching (1996) and is listed in Purdue’s Book of Great Teachers (2003). Jay was named a University Faculty Scholar in 2000 and was the James and Lois Ackerman Professor of Agricultural Economics at Purdue before moving into administration. His research focuses on strategic management of food and agribusiness firms and adoption of new technology by agribusiness. Jay has worked with agribusiness managers in the areas of strategy and marketing in more than 20 countries. He received his master’s degree and doctorate in agricultural economics from Purdue University and his bachelor’s degree from Murray State University in Murray, Kentucky.